Post stud earrings measure approximately 5/8" long and 5/8" wide. This is a wonderful piece of Navajo artistry! This piece of Native American jewelry is Navajo hand crafted by artist Anna Spencer, out of genuine sterling silver and real Onyx stones. 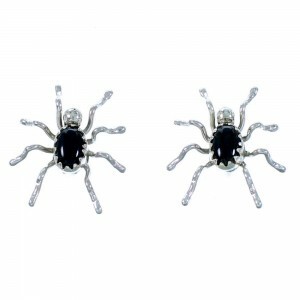 This pair of earrings has a total of TWO stones (ONE in each earring) that are gently set in hand cut bezel settings that are placed in the center of magnificent silver spider designs. 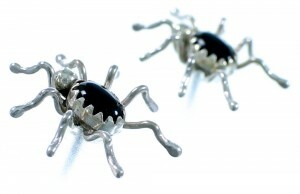 Hand crafted silver work creates the spiders' head and legs for a stunning finish.